Muffins are one of my very favorite things to bake and EAT They are healthy (or at least can be), are a breakfast-y food, (which is my favorite meal of the day), and they are fun to make and hard to bomb (unlike layered cakes). Not only that, but they are easy to transport, simple to share and they are versatile- with mix-ins and toppings. I am a fan. With this passion and adoration for muffins, I have made a whole lot of them in the past 20 something years and I have a few tricks I have learned along the way. I am excited to share them with you. * I have found that when baking muffins that have berries, the berries tend to stick to the bottom of the pan and therefore, it is helpful to use paper muffin liners. However, I tend to shy away from muffin liners due to the loss of muffin, which sticks to the paper. So, I have learned that if you use the paper muffin liners, place them in the pan and then grease the inside of the paper liners and the muffins beautifully peel away from the paper. *Use an ice cream scoop to measure your batter. (My mom taught me about scooping cookies this way, which I will post about soon, but scooping batter is a more recent practice). Most of the time, the batter will be too thin to actually “scoop”, however, the scoop allows you to have a consistent portion of batter in each cup. You simply scoop the liquid and carefully tip over the scoop, pouring the batter into the cups. *Getting the correct amount of batter in your cups is important to make sure they don’t overflow or end up skimpy. 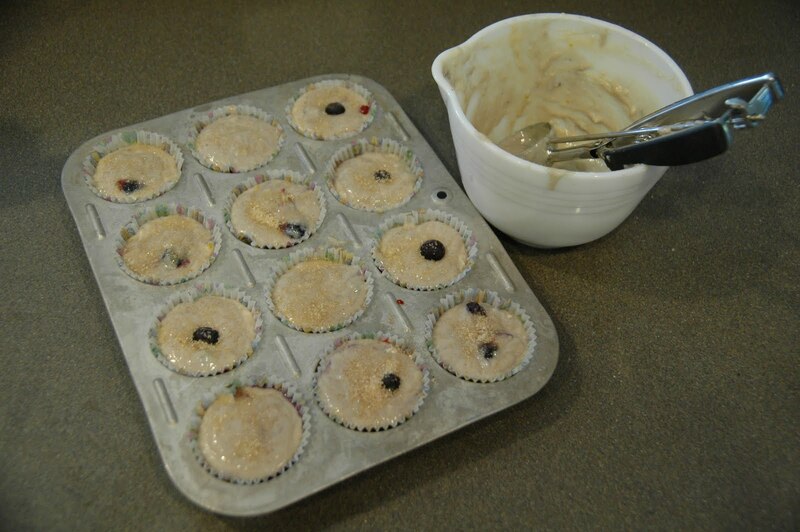 At times, recipes instruct how full to fill the muffin tins. However, I have found that often times there is a variance. Some muffins crown and others spread on the top. I have learned that it is helpful to take note the first time making a recipe. I typically fill the tins ¾ full the first time and then make a note on the recipe of the “correct fullness” for the next time. *If your recipe includes berries and/or chocolate chips, toss them in the dry ingredients before stirring them into the wet ingredients- this help keeps prevent them from getting into clumps. *When you are adding various “mix-ins” to your muffins, sprinkle a little of the mix-in on top in order to identify the type (as well as a nice decorative touch). 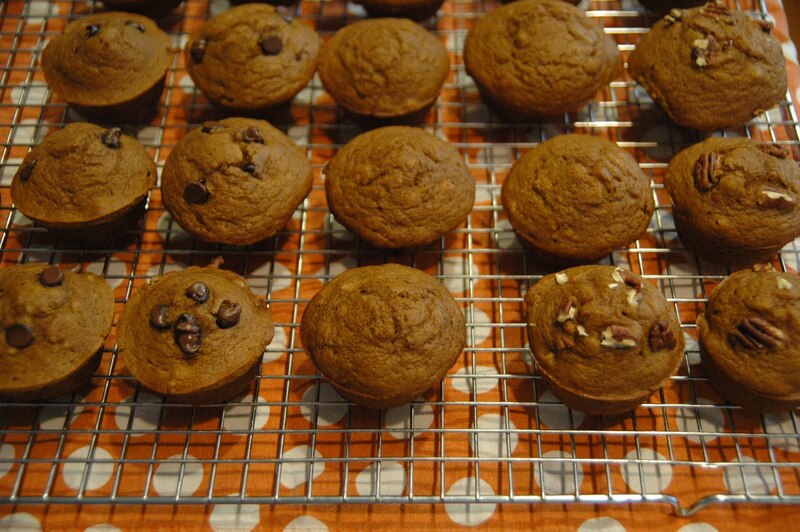 For example- I made 3 varieties of my pumpkin muffins: plain, pecan and chocolate chip…noted by the ingredient on top. I really like a healthy muffin and there are some simple ways to lighten muffins up without compromising the taste or texture! -You can use low-fat vanilla yogurt in place of butter or margarine. I typically use ½ of the amount of butter called for and the other ½ yogurt to keep the flavor and texture true. It works really well. -You can use egg whites in place of some of the eggs. 3Tbsp. egg white = 1 egg. I again, use some of each. -Wheat or white wheat flour can be used instead of all-purpose flour. You can experiment on what proportion you want to substitute. You want to make sure it doesn’t compromise the fluffiness. 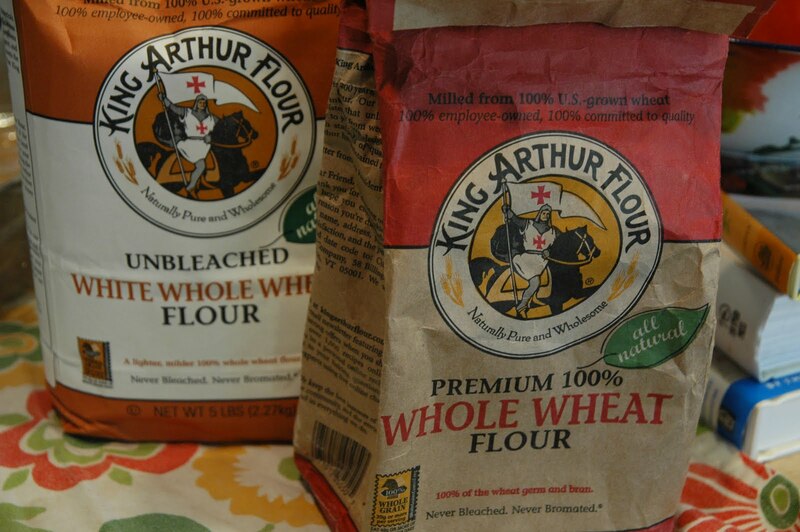 (King Arthur Flour has a great white wheat flour that you can pick up at the grocery store). My bread-mentor, Steve, introduced me to King Arthur Flour products and their great website. Their recipes make me drool. I have tried several of them and they are keepers for sure! The most recent recipe I have used is the Pumpkin Muffins. They are autumn-in-a-muffin; moist, spiced, fluffy, beautiful- I made them for my class last week and can’t wait to make them again! I made 3 varieties, because I was making them for my family and for my 8 a.m. class. My students had mentioned pumpkin chocolate chip muffins and I knew my kids would like plain and I would choose pumpkin pecan. I think they were all pretty great. I wish I had a pumpkin pecan one right now. Preheat the oven to 400°F. In a large bowl whisk together the pumpkin, eggs, brown sugar, oil, molasses, salt, spices, and milk. Scrape down the sides and bottom of the bowl. Whisk the flour, baking powder, and baking soda together. Add all at once to the wet ingredients and mix until all ingredients are well combined. Spoon the batter into the greased muffin pan. Almost filled to the top. Bake for 18 to 20 minutes, or when touching springs back. Makes 12 muffins. Beat all the ingredients together until the mixture is smooth. Serve with Pumpkin Muffins. So, there you have it: Goodwill, Flow Charts, Freezing your leftover ingredients, Muffin Recipes and Tips! Whew! Glad to get all that out there! Let me know what you cook up. I've been told that there is a shortage of canned pumpkin this season. Soooo, if you find it in your store, stock up! (and tell us where you found it!) One merchant told me I could buy a pumpkin and cook it. I hope I find canned! Hi Julie!! So glad you are blogging! Thanks for the muffin tips, and freezing buttermilk – brilliant. Will be following! Welcome Betsy! Yes, my husband found canned Pumpkin today at the store and brought home 4 cans- muffins will be made this weekend! 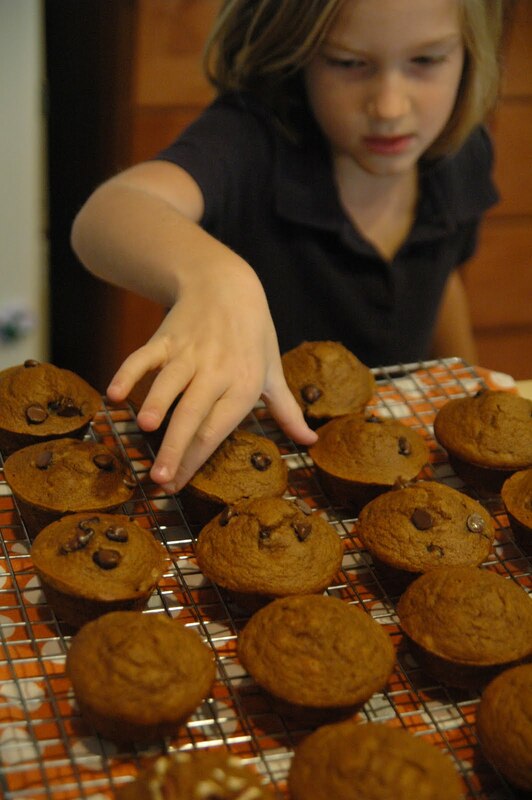 Julie- I am going to try these with chocolate chips- do you use 1/2 cup? 1 cup? Also, I am loving the liquid measuring cups! I got the tiny one and also 2 other larger sizes. I've already used them multiple times. Fantastic recommendation. And last but not least, I made the scones this weekend- delicious! I made honey butter to go with them and was in scone heaven 🙂 Thanks! !